Where is the world’s content hosted? Continuing on the series on Internet centrality, an important element of the argument that the web is greatly centralised rests on the fact that the Web’s architecture is becoming less distributed with time. The push towards the cloud has been translated into fewer name servers, and fewer hosting choices. Pingdom, a company dedicated to monitoring server uptime, has conducted an interesting study looking at the hosting locations of the top one million websites (as ranked by Alexa). While some people have expressed serious concerns with Alexa rankings, they provide an interesting sample of highly-visible websites which generate considerable traffic, and this gives us a good snapshot of what the Internet hosting situation looks like today. The results are predictably depressing for someone who would like to see more diversity. Initially, it is noteworthy that the top million websites are hosted in 7,936 cities around the world, which seems quite diverse, but when looking at the distribution of hosting, it seems clear that there is a lot of concentration of content: the top 3 cities account for 10% of all hosting, while the top 10 account for a staggering 22% of all content. 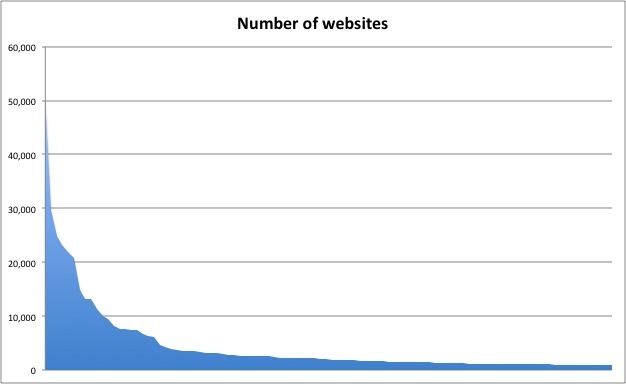 A power law in hosting. The full map shows just how skewed hosting has become, and it helps us get an idea of the issues ahead. Looking at the data in detail, several issues emerge. Firstly, it would seem that we are presented with a power law, or at least with a clear long tail skewed distribution (more details about those concepts in my book). In fact, I have taken the liberty of playing a bit with the data provided, and have come up with some interesting results. Here is the graphic of the top 100 cities, which starkly shows the huge imbalance in hosting. Why is this important? From a legal standpoint, this has huge implications for liability and enforcement. The first obvious one is that by being hosted in a country, you might be subject to enforcement by their authorities if you commit an offence, a lesson that has been in evidence in the Megaupload case. This could include of course civil enforcement of figures that do not exist in your country, such as opening up the potential for patent infringement suits arising from software patents. For a while, I have also been concerned about the international effect of bad legislation. As CISPA is supposed to be resurrected, this might mean that a lot more providers would be covered by the legislation, even if they are not located in that country. In the end, we are faced with a question of governance. The Web’s architecture is highly US-centric, which might explain the fact that its governance is as well. 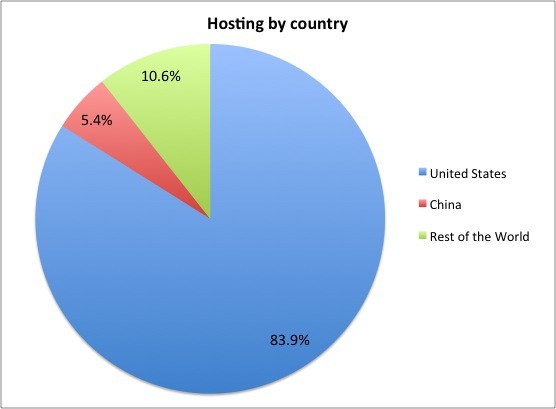 Until the percentages seen above, as well as similar showings in domain name registration, we can expect the world to be subject to US jurisdiction for quite a while. This weird joining of point in time and rate of change is the thing that confuses me about previous posts in this series as well. Regarding this one, should I find that 22% of the top million cites are hosted in 10 cities staggering? I have no idea. What would a properly distributed web look like in terms of the share of top cities? What did the distribution look like at any point in time in the past? Which way is the delta? Not clear to me either direction should be assumed. 83.9% of the top million sites hosted in the US is pretty unambiguously depressing and important for the reasons you state. But what's the direction?